Kris Boyd says the Kilmarnock players must take responsibility for the dismal form that resulted in a 4-0 home defeat by Ross County on Saturday. 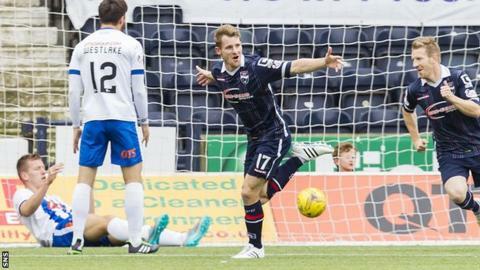 Gary Locke's side prop up the Scottish Premiership table with two points after five games. "Like the manager said, he will take the brunt of things but we're not doing things that he's asked," said Boyd. "I don't think you can just point the finger at the defence. Over the pitch, collectively, we've not been at it." Kilmarnock were four goals down to the Staggies after 35 minutes and the deficit would have been greater had goalkeeper Jamie MacDonald not made some good saves. Locke described the first half display as "embarrassing". Killie's last home win was in March and they have won only once in their last 14 matches. They play Berwick Rangers in the League Cup at Rugby Park on Tuesday and travel to Fir Park to play Motherwell in the league on Saturday. "We've got a massive cup game on Tuesday night," said Boyd on BBC Scotland's Sportscene. "It gives us a chance to get back on a football pitch and rectify the mistakes that we made on Saturday. "When you lose goals after three, four, five, ten minutes, we're not giving ourselves a chance. "In any game we've always found ourselves behind. It's difficult to stamp your authority on the game if you're having to come from behind every week. "If we knew the answers we would have [fixed] it. It's been difficult but as a group we need to get our finger out. "Tuesday night gives us an opportunity to go into a cup game and hopefully get a positive result that should set us up nicely for the weekend."